At the end of Al's last trip report to the Caddo River, he mentioned paddling the North Canadian River. This is one of our favorite local rivers for paddling due to the sandy banks, plentiful wildlife and the fact that we rarely see any other boats on the water. Of course, there are always exceptions. 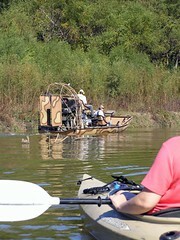 We ran into an Air Boat on our last trip paddling the North Canadian River near Checotah, Oklahoma. I am looking forward to paddling the section that is near OKC, but it sure is a bummer being stuck home during this long weekend of great weather! I hope you get sometime outside in the sun! This Thanksgiving Holiday won't include any paddling for our family due to the unexpected arrival of Cold & Flu season. I started sneezing about 3 days ago and now the whole family is down with the sickness. Thankfully Al from OKC, one of our loyal blog readers, was kind enough to send in a paddling trip report from nearby Caddo Gap, Arkansas. Donna and I made a quick run over to Caddo Gap, Arkansas a couple of weeks ago and I thought I'd drop you a line about it in case you hadn't been there yet. It's pretty easy to get to... just an hour and a half straight south of Van Buren. The river was a bit boney at this time of year but still kayakable (a solid class 2 with lots of short shallow rapids). I had never experienced willow strainers like they have there and it was quite different. We covered about 5 miles or a bit more on the river and probably dealt with about 15 strainers. As we approached each one, we'd have to listen and look carefully to see which way the river diverted (right or left). With a little practice, we got pretty good atreading the water flow after determining that the ONLY way around each strainer was to take the path of least resistance and fastest flow. Each set of rapids involved a short burst of about 50-75 yards always on asharp curve and mild drop in elevation followed by a stretch of flat water to reorient the kayak and relax for a while. I imagine the rapids would be a bit easier with spring rains as there wouldn't be quite as many large rocks to hang up on. Even so, it was a pretty nice experience and provided us somewhere different to go although not quite as scenic as Lower Mountain Fork. The one major drawback was a lack of really nice lodging. We rented a pleasant and clean but fairly old cabin right on the river bank and across the road from an outfitter in Caddo Gap (Caddo River Cottage). I will say it was convenient being able to chain the kayak to a tree at the rivers edge and not load and unload it a lot. The outfitter across the road will portage you upstream ($10) with your kayak or canoe for a short 1 mile float home or will lead you to his pick-up on the river in Henderson (I think that's the right town name) a few miles down river to park your vehicle and bring you back to put in at the cabin (20). We did both over the two days. Overall, it was a pretty good weekend away and the river was a new challenge for building our skills. 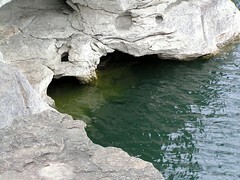 By the way, although the air temp was about 70 at the time, the waterwas about 50 so I was glad we brought dry-suits. Even with that, we were a bit chilled by the end of the long run. As a result, I just got Donna a full body front zip wet suit and scuba boots to keep her warm and dry through fall kayaking. Well, that's it for this report. Might hit the Canadian by Overholser this weekend for some exercise now that we had a little rain. Can't wait til spring or for a really nice weekend. We'd like to go run part of the Buffalo River in Ark. if we can. Looks like a really scenic area. Unfortunately, all the really nice cabins on the Buffalo were full last time so we chose the Caddo instead. Wow, Puerto Rico...that sounds fantastic Al! I'll be stuck at home until my family manages to get healthy enough to paddle again, but you can bet I'll only have one thing on my mind until then! Got a great Oklahoma area paddling trip report you would like to share? Send me an email or leave a comment on the blog. Oklahoma supports a wide assortment of interesting birds associated with the prairies and others associated with the western mountains. Some of the cool predator species found here include: Prairie Falcons, American Kestrels, Mississippi Kites, Swainson's Hawks, Ferruginous Hawks, Red-tailed Hawks, Cooper's Hawks, and Golden Eagles. 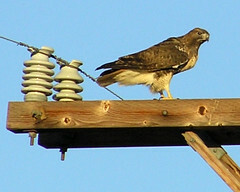 Since raptors are at the top of the food chain, observing them helps to identify environmental problems before such problems become a crisis. Also, I find them to be pretty darn photogenic. Watching the various birds of prey is one of the things that I really enjoy when paddling the Illinois River. Seen any cool raptors lately? I got a tip from a blog reader this week that Cherokee Landing offers some of the best camping on Lake Tenkiller. Tenkiller is a rock bottom lake, this makes it quite a bit clearer than many of the other Oklahoma lakes in the area. Dianne and I are always looking for places to pull the RV to, so I checked our Woodall's Guide (essential RV travel gear) and it says they offer 112 sites with Water & Electric year-around. I hope it won't be too crowded during the off-season. Like most of the Oklahoma Park system, Cherokee Landing, near Park Hill, Oklahoma does not list any WiFi available, so I guess I will have to wait until the weekend to explore this one. While i am on the subject of camping with luxuries I never imagined before, let me ask you this. Have you ever heard of a water activated heating pad for self-heating camping food ? I spotted this new kind of camping food while browsing through their freeze dried foods. It sounds very cool, it would appear that they use chemical heat to activate a flameless heating element that delivers a piping hot meal in minutes! The got killer reviews from Hurricane Rita first responders. I gotta try this.